Happy Friday! Hope you've all had a lovely week. With Mother's Day just around the corner, I wanted to create some cards for our mommas. We're lucky to be able to visit them both this weekend and it just so happens that both of them also share a birthday next weekend, so I did something I've never done before! 'Two-faced' cards! A Happy Birthday on one side, and a Mom's Day greeting on the other! I know...You were probably thinking something else :) So we'll just go ahead and call them 'Back-and-Front' cards. We're planning a small get together, so I also whipped up a batch of matching mini cupcakes. Don't mind these two test versions with all their bubbly icing...The rest actually turned out quite lovely, but I'm rather lazy to photograph them all over again, so these will have to do for now. The gf cupcakes are a recipe from Cloud 9 Specialty Bakery. Love these little guys and that they don't make my tummy hurt. The mix can be found at Costco. And because I have a hard time sticking to anything just vanilla, these got spiked with some coconut flavor and a dollop of creamed coconut filling inside. And cream cheese icing, with a bit of lemon zest. Yum! Back to the cards. As you can see just below, here is what the final, cards look like. 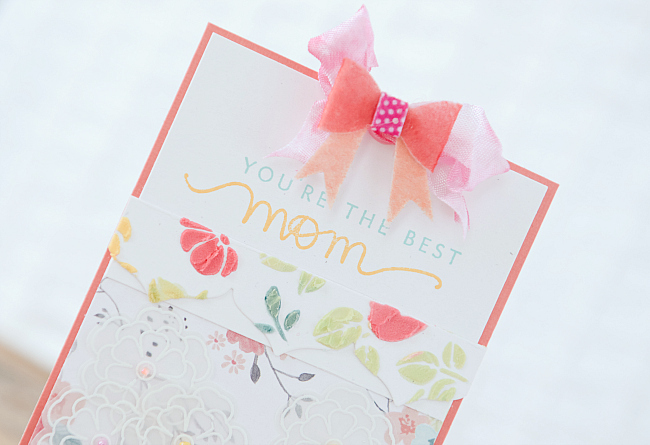 Separated out, here is the first card front, for our momma's who really are the best. No amount of Mother's Day wishes could sum up how lucky we are to have such kind, patient, loving, caring mommas. We're two lucky kiddos. 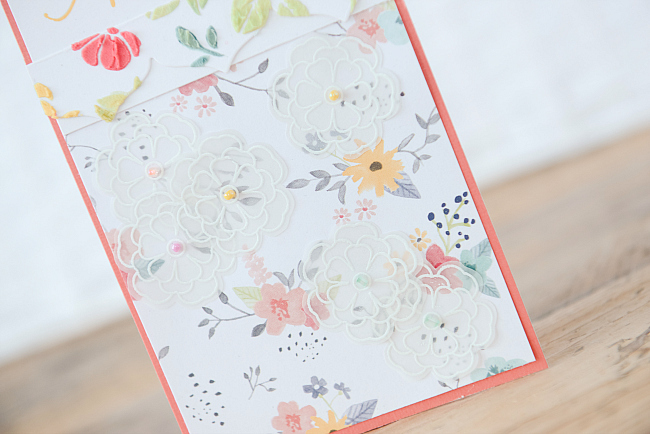 This card features a patterned paper front, and vellum flowers, that I embossed in white and fussy cut. 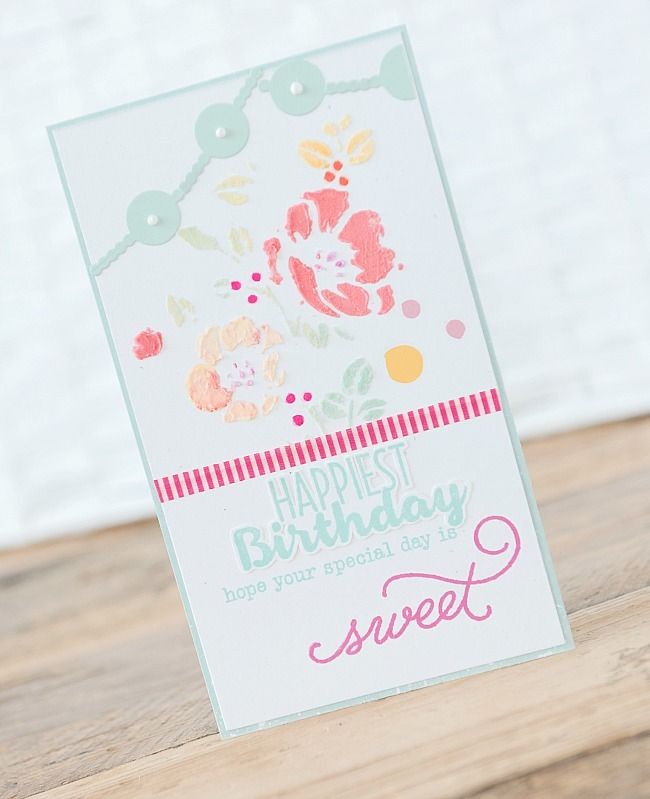 Each flower also has a tiny bead in the center, and atop the patterned paper is a stenciled die-cut. I've included the tutorial for this technique below. For the top, a felt bow and a tiny bit of ribbon. The sentiment is from an older stamp, which I've forgotten the name of, but if anyone knows the brand or name, please feel free to leave it in the comments below to help out fellow readers. 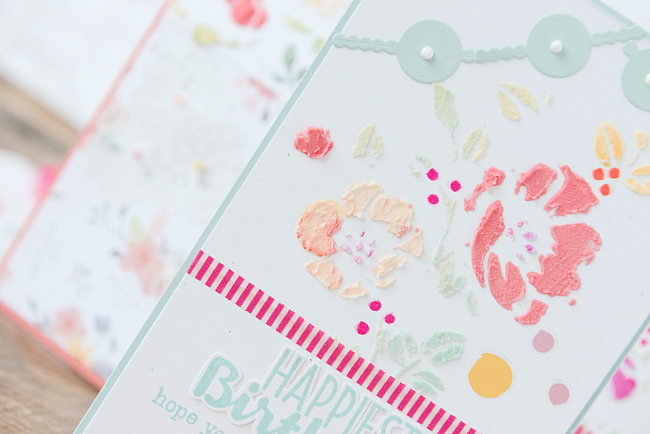 To finish up, I added some tangerine cardstock to back the card - I loooove the pop of color. Next up is the other side of the card for our momma's birthdays. 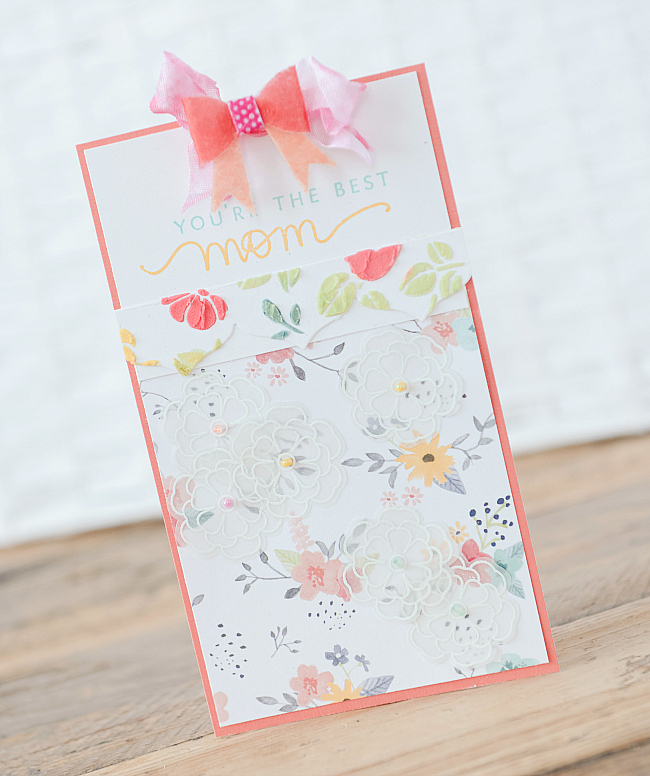 This card front features a larger stenciled piece, and I'd love to share with you how I created it. 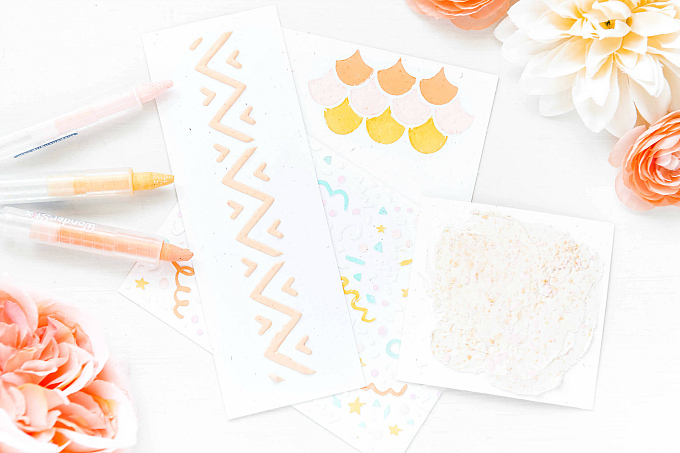 I'm sure you're all familiar with the magic and countless hours of fun that can be had with stencils and molding paste, but just in case you're not... Here's a quick overview! 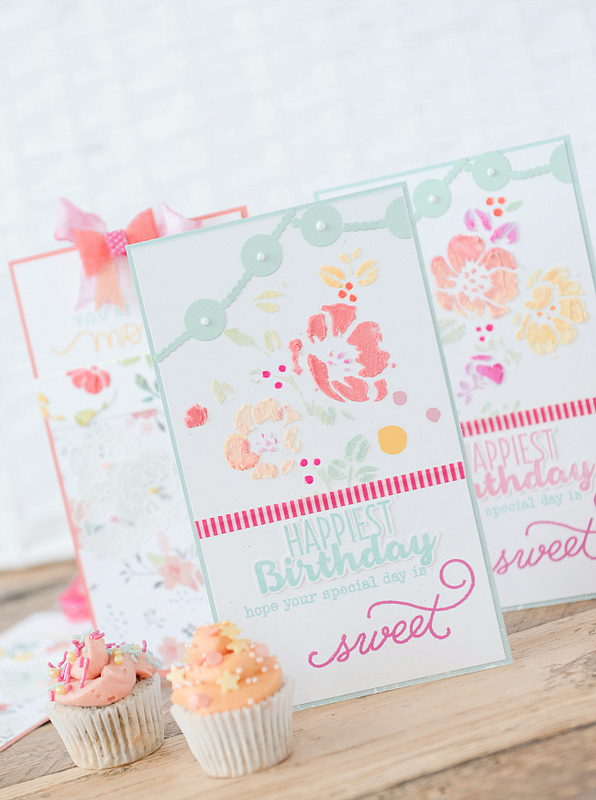 I love, love stenciling with molding paste. So many varieties of paste exist, but any sturdy type will do for this project. Provided that it is white and matte. I use the Golden Molding Paste and I love it. A jar typically lasts me a really long time and it keeps very well so long as the lid is tightly closed. It is not too watery, and my cardstock doesn't ripple from the moisture at all. I've worked with some lower quality pastes before and I found the moisture content too high for working with cardstock. The other supplies you will need are: waterbased dye ink (from dye reinkers or any other concentrated waterbased color medium), putty knife (a plastic one is fine), stencil (I used a gorgeous Tim Holtz floral stencil on my project), tape for holding things in place, and you'll need somewhere to mix the paste (I used a piece of cardboard). Let's get started! I always prep my card first, because once the colors are mixed, you have to work rather quickly to apply them. I place my stencil on the cardstock and secure it with tape (washi tape works great, just as long as it's not too sticky). Then, I mix my colors. To get started, place a little bit of paste, about a tablespoon, onto your cardboard, and mix in a tiny bit of dye ink with your putty knife. Go ahead and mix all of the colors you will be using. But it's imperative that you work quickly. Molding paste dries fast and it becomes harder to spread once it dries a bit. I used very little amounts of dye ink here, to achieve the soft colors. For the mixing, I used Papertrey Ink's Berry Sorbet, Spring Moss, Harvest Gold, Aqua Mist, and Sweet Blush. After your colors are mixed, simply clean off your putty knife and use it to apply the paste on top of the stencil. You can cover the entire stencil, or do as I have here, just picking and choosing which flowers and leaves you'd like to use. The rest is simply like coloring. Select the color you want to use and add it to whichever flower, leaf or shape you're working with. I like a chunky look, so I don't use a leveler after I've applied my colors. But, you can use something level and sturdy, like a ruler, to scrape your paste. This will result in some color mix, but it will give you a smoother, screen-printed look. Just be sure your paste is really applied to your paper so it doesn't come off while scraping. Then the best, possibly most gratifying moment gets to happen...When you peel off the stencil! There is something so exciting about peeling it off, and taking the messy goop out of the way, to leave behind perfectly imprinted images. So. Much. FUN! Once done, it doesn't take long for the card to dry. Actually, while my card is drying, I quickly wash off my stencils, because the paste is much harder to scrape off when it is dry, especially if it is a delicate design stencil. I may have damaged a stencil or two by waiting too long. Oops. Now I clean them as soon as I can, or at the least, soak them in a warm water until I clean them. 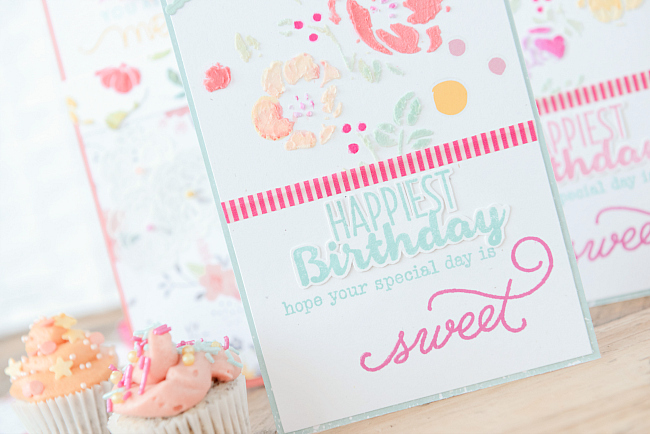 To finish off this card, I added a birthday sentiment at the bottom, using the beautiful new Stampin Up Cool Treats stamp and Papertrey Ink's Strawberry Patch Sentiments, in Hawaiian Shores and Raspberry Fizz inks. 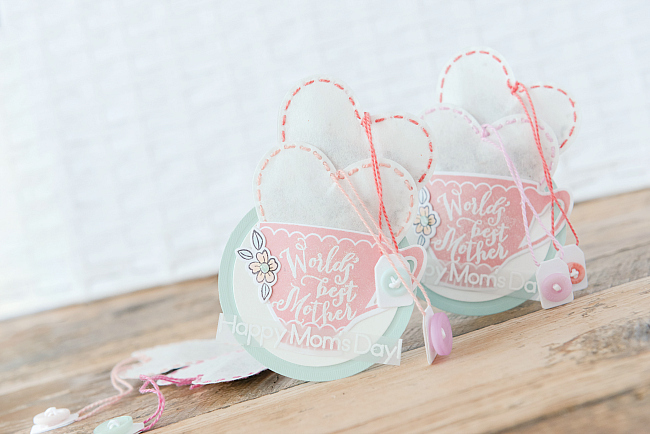 Last up, is another quick project that I've wanted to try for some time now, and Mother's Day seemed like a perfect fit, since I know both our momma's love tea. I've wanted to try my hand at making some baggies for some delish loose tea. I started by die-cutting coffee filters using Papertrey Ink's Limitless Layers: Heart Stitches Die. I especially love this die because the holes are already pre-punched so it's super easy to stitch the heart together so it looks neat and lovely. 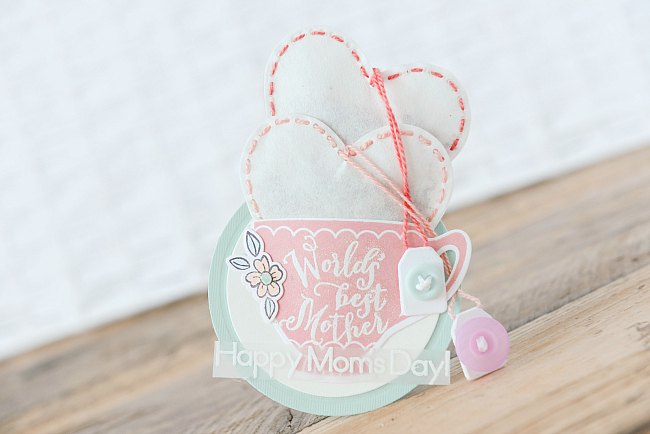 But any regular shaped die will do, as coffee filter paper is really easy to stitch. Even though I made sure to leave mine unstitched at the top, so I could fill the baggies with loose tea, more tea ended up on the counter than in the bags :) I'll just say that a funnel is a really good idea. For the base of the tags, I used Papertrey Ink's Tag Sale #4 die. 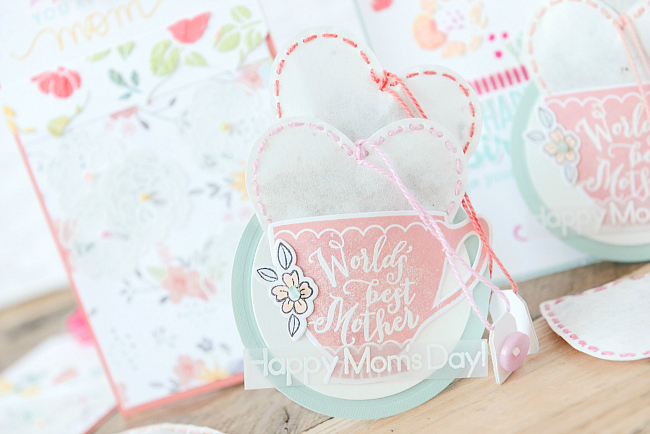 The teacup stamp and die are from Stampin Up, as is the little flower. The embossed sentiment is from another older stamp, but I'm unsure of the name. So much fun crafting with our favorite people in mind. I can't wait to share these with the momma's! 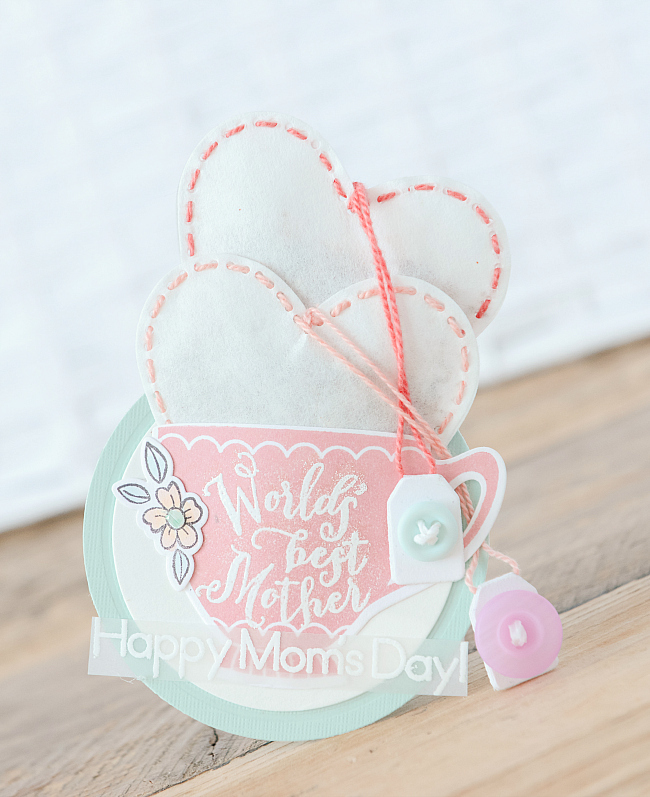 Happy Mother's Day to all the lovely moms out there and thank you for making this world a better place! 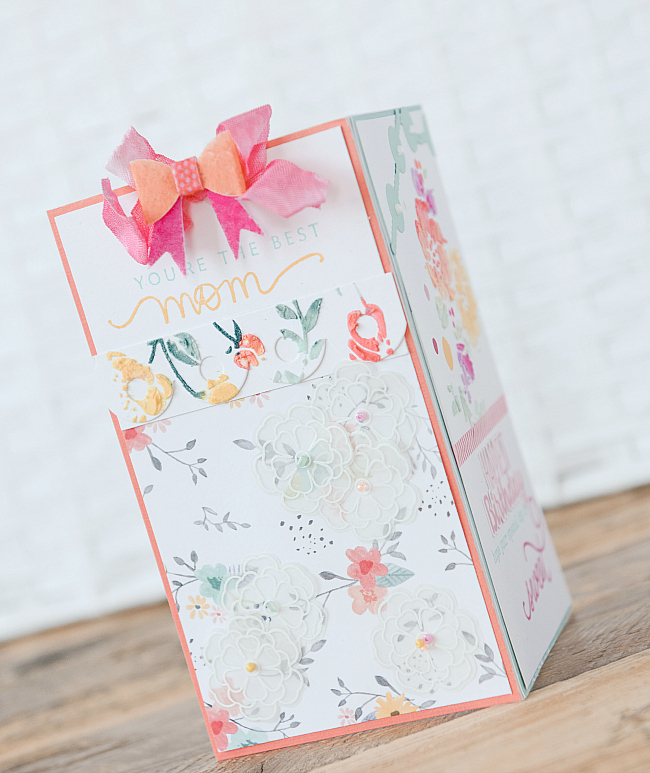 Your cards and projects are lovely. Your Moms will be so happy to get them! I love the color palette, it's so soft and sweet!